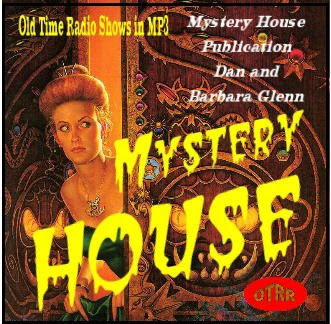 Mystery House -- that strange publishing firm owned by Dan and Barbara Glenn -- where each new novel is acted out by the Mystery House staff, before it is accepted for publication. Mystery House was a program in the 1940s, but not your "run of the mill"-type program. Actually, it was more of a proving ground for novels. Dan and Barbara Glenn owned a publishing company named "Mystery House" located at 70 Park Avenue, New York City. Dan and Barbara decided to test some of their novels on a real listening audience. Each episode was taken from a novel they were planning on publishing. The entire staff at Mystery House was involved, everyone doing their part, whether it was rewriting to adapt it to radio, playing the parts, or doing sound effects -- everyone joined in.